Excel-də fərqli rənglərdə dublikatların necə seçilməsi lazımdır? Excel-də, asanlıqla istifadə edərək, bir rəngli sütundakı dublikat dəyərlərini qeyd edə bilərik Şərti BiçimləməLakin, bəzən biz screenshot göstərildiyi aşağıdakı kimi tez və asanlıqla dublikatları tanımaq üçün müxtəlif rəngli cüt dəyərlər vurğulamaq lazımdır. Excel-də bu vəzifəni necə həll edə bilərsən? 1. Dublikatların fərq rəngləri ilə vurğulamaq istədiyiniz dəyərlər sütununu seçin, sonra isə basıb saxlayın ALT + F11 düymələri açmaq üçün Proqramlar üçün Microsoft Visual Basic pəncərə. MsgBox "Too many duplicate companies! 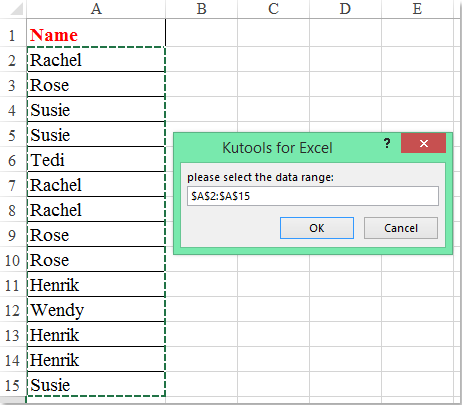 ", vbCritical, "Kutools for Excel"
Oh Damn, You saved my time,,I was taking help of my colleagues all these days and no one had idea about it. Thanks a Ton !!! My spreadsheet also stopped coloring at 178 and I have over 400 lines. How do you fix this? Could you send your workbook to my email address, I may help you to find the problem. This is really great, but colouring stopped after row 76 (5 colours). How can I this be extended too? This is really great, but colouring stopped after row 66 (9 colours). How can I this be extended? The above code works well in my worksheet, i test it in 300 hundred rows. Please try it again. Or you can send your workbook file to my email account. my excel sheet has 11000 row of data. 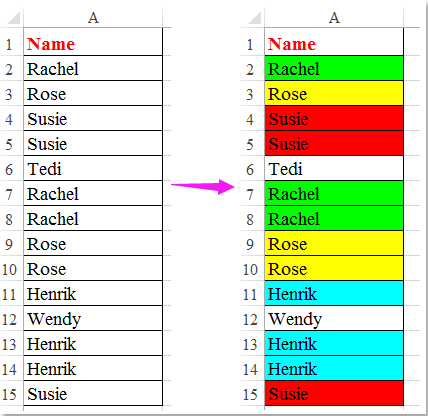 how can I extend it to highlight all the duplicate in that long column. it stopped at row 77. I am new to VBA. Is there any way, that we need not run the macro over and over, it is automated to highlight even if new cells are copied into the column where macro is programmed?